Are you aware that OST files have the ability to work in offline mode? This ultimately helps users to access the data without connecting to the internet. However, there can be a circumstance wherein you need to extract contacts from Outlook OST file to PST format. So that the contacts can be accessed in Outlook when the Exchange server is down due to synchronization issue. The sad part is most of the users are not aware to perform the export process. Here in this blog, we will discuss the best solution to export contacts from Outlook OST file in a comprehensive way. Just like the above scenario, there are numerous users who are searching for a reliable solution to export Outlook contacts from OST file. Well, there can be various reasons for a user to extract the contacts. For instance, creating a backup of contacts is a good option to prevent any future corruption or data loss. For that, a user must convert the OST file to a portable file format like PST, so that the PST file can be used as a backup and also allows the user to access the contacts in Outlook application. So, the choice and requirement is left as per the need of the users to export the data. To begin with, launch Microsoft Outlook on your system. Select File menu and choose Open&Export and click Import/Export option. 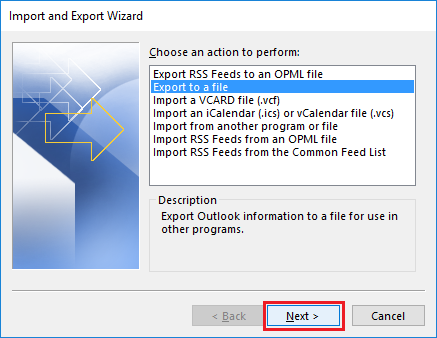 Under Import and Export Wizard, select Export to a File option and click Next. From Export to a File dialog box, choose Outlook Data File(.pst) and click Next to move further. 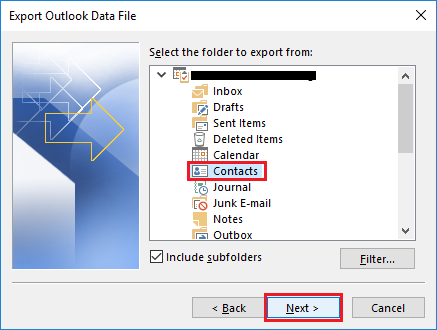 Now to extract contacts from Outlook OST file, select Contacts and mark the checkbox corresponding to Include subfolders option and click Next. In Export Outlook Data File wizard, click Browse and select the desired location to save the PST file. In the same dialog box, select Replace duplicates with items exported radio button from the list of options and click Finish. 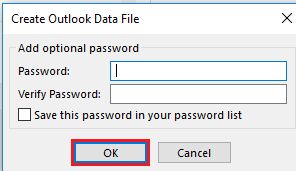 In case, if a user wants to protect the PST file, create the password under Create Outlook Data File wizard and click OK.
After extracting contacts from Outlook OST file to PST format. Import the converted PST file to MS Outlook to easily access the contacts. Risk of data loss while extracting the data. Must be technically strong to perform the tiresome steps. If the OST file is corrupt, the entire process goes in vain. 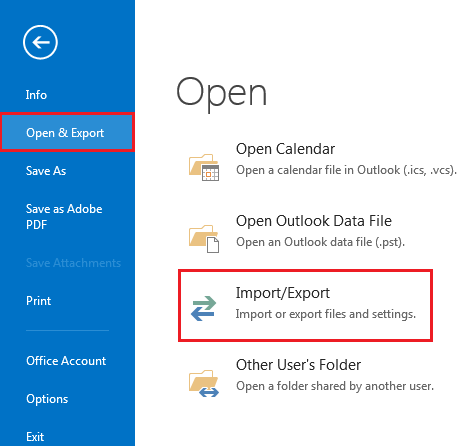 Connectivity to Exchange server is required to export contacts from OST file. Novice users fail to implement due to its complex steps. After reading and knowing the above described manual limitations will definitely bring you down and nervous. Now, you might be searching for some smart and trustworthy solution. Therefore, we have come up with an alternate option to extract contacts from Outlook OST file using the automated tool that is discussed below. OST PST software is a hassle-free tool that has brought a complete relief for the users. This tool is incorporated with numerous features that allow to extract contacts from Outlook OST file within few simple clicks. By using this tool, there is no risk of data as it is designed with the advanced algorithm. No doubt, the tool provides a simple and friendly interface to convert OST mailbox item to different file formats. The best part is this tool can be easily downloaded on all versions of Microsoft Outlook. While opting the manual method to extract contacts from Outlook OST file, a user may have to face many challenges. Considering the various consequences of the manual method, it is wise to choose professional tool. It is a futuristic tool breaking all the shortcomings of the manual methods. So readers, what are you waiting for? Download the tool right now on the system to export contacts from Outlook OST file. Copyright © 2011–2019 www.ostpstsoftware.com | All Rights are Reserved.